In architectural design it is of cardinal importance to anticipate how people will use a building prior to its construction and occupation. Conventional multi-agent simulation methods represent occupant movement and activities to assess the day-to-day performance of households and oﬃce buildings. In these environments, behavior is usually driven by individual schedules or comfort-related actions. In other kinds of settings, such as hospitals, airports, or factories, behavior is driven by codiﬁed sets of collaborative procedures which dynamically adapt to the spatial and social context. To address these building types, we propose a narrative-based approach whereby a variety of behavior patterns involving multiple occupants can be simulated and visualized. 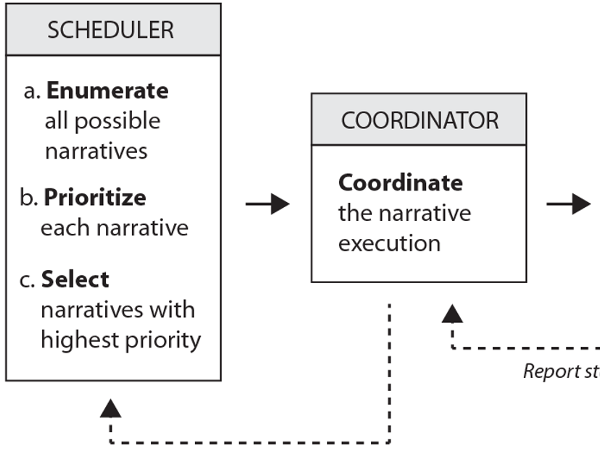 A scheduling method coordinates the narratives using Operations Research techniques. The method is demonstrated through a preliminary study, which involved collecting data in an existing hospital environment, modeling narratives computationally, and simulating them in an abstracted layout of a generic hospital ward.